I posted a while ago about scrobbling to last.fm without iTunes, so i thought i’d write about how to do this using winamp and the ml_ipod plugin. Once you have installed winamp all you need to do is download the plugin from the site above and install it. If you want to scrobble to last.fm you need to check the box during the install as this feature is not installed by default. 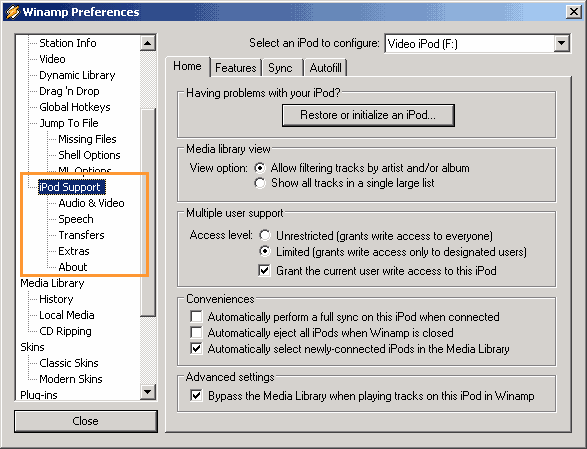 Once it is installed, connect up your ipod (it supports most ipods) and it will ask you for some details about what model of ipod it is. You will also need to enter your last.fm details into the “Audioscrobbler for Winamp” plugin (found under General purpose plug-ins). There is very little configuration required for the ml_ipod plugin although there are a lot of options that you can explore.